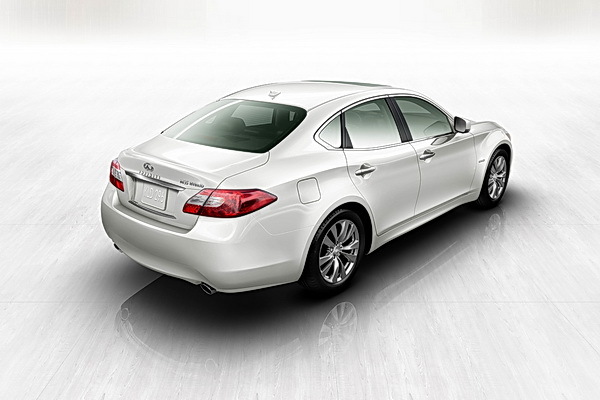 Infiniti M35 hybrid in 2011: enough power to play chicken while still being green? A bit of power with your social consciousness? 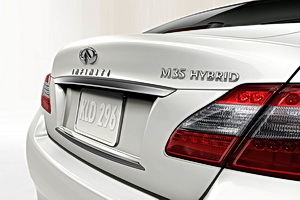 Infiniti says it can deliver both with its M35 hybrid to go into production on its 2012 model due for arrival in spring 2011. 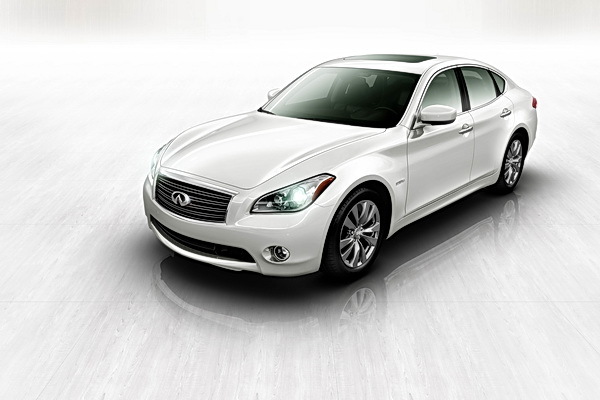 Based on Infiniti’s luxury performance sedan “M” series, the hybrid has a proprietary system by which the 3.5-liter V6 and electric motors are connected to the engine’s output shaft, and the implication is that the flow of power to the transmission would make Danny and Kenickie from Grease happy. Okay, maybe it would make the 40-year-old versions of them (replete with a PTA wife and ungrateful kids) happy, but still, Infiniti is obviously trying to make the M35 less like its hybrid counterparts that tend to lurch when they transition between gas and electric modes as well as quietly creep up on you all spooky-like. The other Nissan-specific technology of note is this new “laminated” lithium-ion battery pack. No bigger than a standard battery, it lasts longer and the lamination bolsters the battery’s cooling abilities, making it more reliable, which would probably bring comfort to Danny’s bakesale-committee wife. But what about the greenies? Where are they on the “buy an old car to avoid using resources to make new products” vs “we need to transition at some point” argument? That debate will continue for a while, so let’s go back to the M35. I was curious about the decisions that went into producing this car, or any car for that matter, in such a tough market. I posed that question to Infiniti’s Senior Manager of Communications, Kyle Bazemore, but he didn’t seem worried. He took a more, “If you build it, they will come” approach, and here’s what he said: “If you look at our spot in the market, where our cars are all about the drive, we wanted to make a more economical, more eco-friendly vehicle, but it still has to inspire at every turn.” Ok, while I still can’t quite see it in a drag race at the reservoir, Nissan’s Infiniti brand is clearly trying to distinguish this hybrid from its brethren and lure customers to the green side with un-hybridy features, customers who are less Ed Begley, and maybe more, say, an eco-conscious Steve McQueen. This is a strange old vehicle without the call being in style. Other models in the Infiniti line up, with the exception of the FX are pretty conservative, but at least more or less passable. It’s really a pudding. And supposed to be kind state of the artish hybrid. Afraid you ll have to do much better, Nissan, Infiniti, if you want to be taken seriously in Europe (including Denmark). Guess what it shows is that whatever is in style with the American market in mind, does not translate all that well in Europe, while on the other hand, the Euro-style has a hearing significant in the upscale market in the United States.